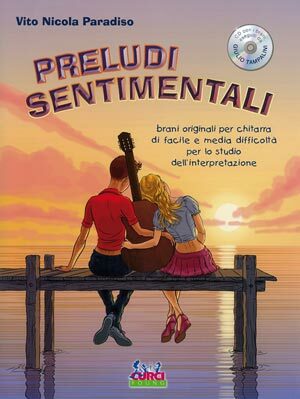 Love, emotions and palpitations run on six strings with Sentimental Preludes: A new collection of original pieces for guitar of easy and medium difficulty for the study of interpretation. Designed as an ideal continuation of the trail began with the famous guitar method The steering wheel, the new score, Vito Nicola Paradiso is aimed at students who already have basic knowledge and technical skills (second and third year of study). Each prelude is inspired by a feeling that describes the sound sensations produced by the music. The educational objective is to involve the student in a personal research on their own emotional states, accompanying the development of critical thinking and the ability to make personal choices of interpretation and original. Dedicated to young guitarists who want to express through music the first, exciting emotional turmoil of adolescence. The accompanying CD contains all the songs you can listen to the interpretation of the virtuoso Giulio Tampalini. Julius Tampalini, one of the most famous Italian guitarists on the concert scene, has won some of the major international competitions of his instrument ("Sor" Rome, "Segovia" Granada, "Pittaluga" in Alessandria) and held for years an intense artistic activity throughout Italy, Europe and America. He has published numerous CDs and DVDs dedicated to the greatest composers for guitar (J. Rodrigo, M. Giuliani, F. Tarrega, H. Villa-Lobos, A. Gilardino, M. Castelnuovo-German) who received a broad consensus on the part of public and critics awards Italian and foreign.